Joseph Lister performed the first antiseptic surgery, using carbolic acid (phenol) to clean the wounds of an 11 year old boy whose leg had been run over by a cart. The technique led to post-operation infection mortality rates dropping from 50% to 15%. Thomas Edison made the first sound recording, of "Mary Had a Little Lamb." Asaph Hall discovered Mars' moon Deimos at the US Naval Observatory in Washington, D.C., prior to discovering the larger Phobos on 18 August. Paul Henry discovered asteroid #227 Philosophia. C. H. F. Peters discovered asteroid #234 Barbara. W. Lorenz discovered asteroid #685 Hermia. K. Reinmuth discovered asteroids #1000 Piazzia and #1025 Riema. NASA and the USAF launched X-15 mission # 19 in which USAF Major Robert M White flew an X-15 to a maximum altitude of 41.605 km with a maximum speed of 2852 kph (Mach 2.52). NASA launched Echo 1 into Earth orbit, the first successful communications satellite, to relay voice and TV signals. Following the failure of the Delta rocket carrying Echo 1 on 13 May 1960, Echo 1A (commonly referred to as just Echo 1) was successfully put in a 1519 x 1687 km orbit on 12 August 1960. 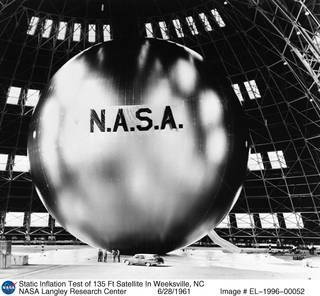 The spacecraft was a 30.48 meter (100 foot) diameter balloon of mylar polyester film 0.5 mil (0.0127 mm) thick, designed and successfully used as a passive communications reflector for transcontinental and intercontinental telephone (voice), radio, and television signals. The first two-way voice communications was bounced off Echo I on 13 August 1960 between Cedar Rapids, Iowa, and Richardson, Texas. The first reported picture transmission took place on 19 August, from Cedar Rapids to Richardson. Since its shiny surface was also reflective of visible light, Echo 1A was visible to the unaided eye over most of the Earth. Brighter than most stars, it was probably seen by more people than any other man-made object in space. It had 107.9-MHz beacon transmitters for telemetry purposes, powered by five nickel-cadmium batteries charged by 70 solar cells mounted on the balloon. Because of the large area-to-mass ratio of the spacecraft, data for calculation of atmospheric density and solar pressure could be, and was, acquired. The spacecraft was also used to evaluate the technical feasibility of satellite triangulation during the latter portion of its life. 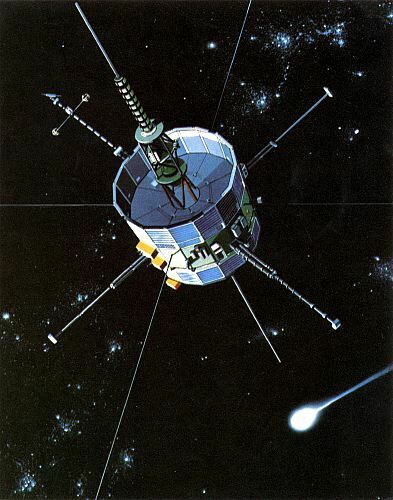 Echo 1A re-entered the Earth's atmosphere on 24 May 1968. USSR launched Vostok 4 carrying Pavel Popovich, the fourth Soviet cosmonaut to orbit Earth, resulting in the first time there were two people in space simultaneously. Vostok 4 was launched 12 August 1962, one day after Vostok 3, with cosmonaut Pavel R. Popovich on board. The spacecraft consisted of a nearly spherical cabin covered with ablative material. There were three small portholes and external radio antennas. Radios, a life support system, instrumentation, and an ejection seat were contained in the manned cabin, which was attached to a service module that carried chemical batteries, orientation rockets, the main retro system, and added support equipment for the total system. The service module was separated from the manned cabin on reentry. The flight lasted 64 orbits over 70.7 hours, and was in an orbit close to Vostok 3. Minimum distance between the two spacecraft was approximately 5 km. Radio communications were maintained between the two spacecraft and Earth during the flight. For the first time, TV pictures were transmitted from the spacecraft and broadcast by the Soviet TV system. A series of scientific and biomedical experiments was also performed. The spacecraft landed on 15 August in the Karaganda region at 48:09 N 71:51 E. Vostok 3 and 4 landed successfully six minutes apart a short distance from each other. Vostok 4 was a joint flight with Vostok 3, for acquisition of experimental data on the possibility of establishing a direct link between two space ships; coordination of astronauts' operations; and to study of the effects of identical spaceflight conditions on the human organism. The launch of Popovich proceeded exactly on schedule, with the spacecraft launching within 0.5 seconds of the planned time, entering orbit just a few kilometers away from Nikolayev in Vostok 3. Popovich had problems with his life support system, resulting in the cabin temperature dropping to 10 degrees Centigrade and the humidity to 35%. The cosmonaut still managed to conduct experiments, including taking color motion pictures of the terminator between night and day and of the cabin interior. Despite the conditions, Popovich felt able to go for the full four days scheduled. But before the mission, Popovich had been briefed to tell ground control that he was 'observing thunderstorms' if he felt the motion sickness that had plagued Titov and needed to return on the next opportunity. Unfortunately, he actually did report seeing thunderstorms over the Gulf of Mexico, and ground control took this as a request for an early return. He was ordered down a day early, landing within a few mintutes of Nikolayev. Only on the ground was it discovered that he had been willing to go the full duration, and that ground control had mistakenly thought he had given the code. USSR launched Cosmos 434 from Baikonur, the final LK Moon lander test using the T2K version. USSR launched Cosmos 434 on 12 August 1971, whose initial orbital data was similar to Soyuz-type flight data but with a later Lunar or interplanetary orbital launch platform. Analysis at the time indicated it was a possible test of new Lunar-type engine system; it was subsequently determined to be the final LK Moon lander test using the T2K version - ten years later, the spacecraft was due to re-enter over Australia soon after the Skylab scare. The Soviet Union told the people of Australia not to worry, it was only an experimental Lunar cabin - the first inadvertent admission that their manned Lunar project even existed! Cosmos 434 was the final space test of the LK Moon lander test using the T2K version. It followed the same program as Cosmos 398. The LK ("Lunniy korabl" - Lunar craft) was the Soviet Lunar lander - the Russian counterpart of the American LM Lunar Module. The LK was to have landed a Soviet citizen on the Moon before the Americans, winning the Moon race, which did not happen for a variety of reasons. Because the translunar payload of the Russian N1 rocket was only 70% that of the American Saturn V, the LK differed in many ways from the LM. It had a different landing profile; it was only 1/3 the weight of the LM; it was limited to a crew of one; it had no docking tunnel (the cosmonaut had to space walk from the LK to the LOK lunar orbiter). Unlike the LM, the LK would not use a separate descent stage to go from Lunar orbit to landing on the surface. A braking stage, the Block D, was to take the LK out of Lunar orbit and slow it to 100 m/s at an altitude of 4 km above the Lunar surface. From there, the LK would use the engines of its Block E stage to soft land on the Moon. The Block E would also serve as the ascent stage to return the LK to Lunar orbit. The LK consisted of four primary modules: 1) the LPU landing gear, to allow landing on the Lunar surface, which would remain behind on the Lunar surface, acting as a launch pad for the rest of the LK; 2) the Block E rocket stage, to soft land the LK on the Moon and return it to Lunar orbit; 3) the Lunar Cabin, the pressurised semi-spherical cabin where the cosmonaut would be located; and 4) the Integrated Orientation System, a pod of small thrusters to orient the spacecraft. Atop the pod was the large hexagonal grid of the Kontakt docking system. USSR launched Cosmos 672 from the Baikonur cosmodrome aboard a Soyuz rocket, an unmanned precursor to the Apollo-Soyuz Test Program (ASTP). The first manned free flight in the Approach and Landing Test (ALT) of NASA's Shuttle test orbiter Enterprise was conducted. NASA launched the High Energy Astronomy Observatory 1 (HEAO 1) satellite into Earth orbit, the first in a series of three to continue X-ray and gamma-ray studies. NASA's ISEE 3/ICE Comet Giacobini-Zinner and Comet Halley encounter mission was launched. IBM introduced its PC (Personal Computer) and PC-DOS 1.0. While many microprocessor systems preceded it, the open architecture led to a revolution of explosive growth in computer accessibility and use, making computers ubiquitous. NASA STS 105 docked at the International Space Station during ISS Flight 7A.1. NASA launched the Mars Reconaissance Orbiter (MRO) toward Mars to continue studies of the planet, to examine potential landing sites for future surface missions, and to provide a high-data-rate communications relay for those missions.